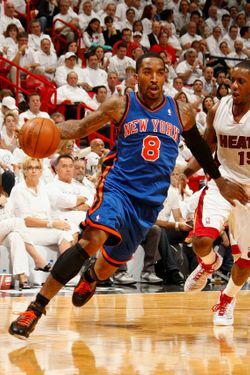 Howard Beck of the Times reports that J.R. Smith will decline the 2012-2013 option in his Knicks contract. Smith has until Tuesday to decide and will reportedly opt out of the guaranteed $2.4 million and try to re-sign with the Knicks at a slight raise. By way of Smith's non-Bird rights, New York can pay him 20 percent more than they did last year (about $2.8 million) without eating into the MLE that we discussed earlier today. Of course, if Smith wishes to seek more money elsewhere, this also leaves that option open. Beck's report suggests that Smith's priority is to return to New York, though. Here's to more fade-away jumpers, Instagram photos, and late-night bike rallies!